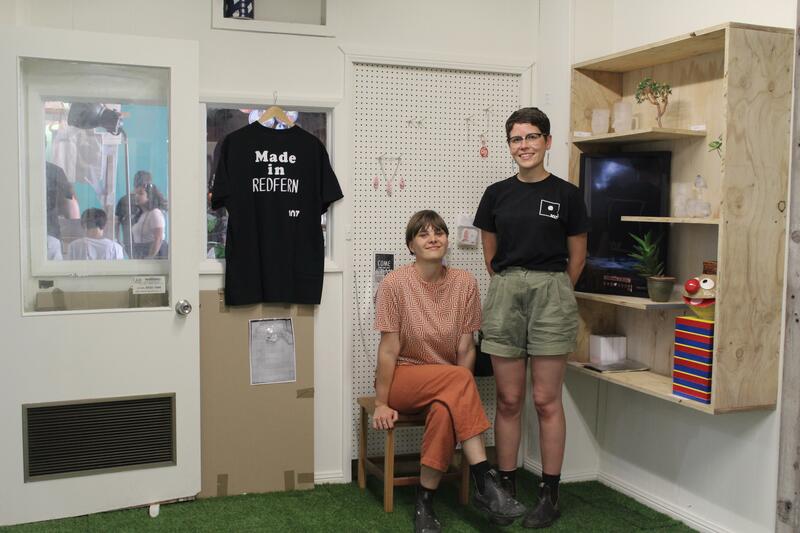 Starting a business from scratch: Meet the volunteer duo behind 107 Objects – the 107 blog. In October 2017, a long-term dream of 107’s came to life: 107 Objects. The online store and exhibition space is a sustainable, accessible way for emerging artists to fund their practice. It’s more than just a store though – after operating costs, 100% of the profits will go towards seeking out and commissioning work from exciting new Australian voices. Bernie: I’m Bernadette Margaret Joy Fingleton – usually responds to Bernie. I’m a twenty something creative from Sydney who lives for smart and ethical design. Amy: That’s so broad! I guess I’m a Media & Communications student at Sydney Uni, and the Comms manager at 107. I love communications because it gives me a chance to meet interesting people and get a peek at bits of the world that I otherwise wouldn’t get to see. B: I can spout water through my gap teeth. I’m practicing how to drink a beer that sits atop my forehead, without using my hands though – ‘twas Dad’s ultimate party trick. B: We met through a mutual friend. Old mate Lachlan lined me up as 107’s sign writer and introduced the two of us. Amy was glad I came in as she hates heights and these boards are near three metres high. Lachlan forgot to relay that information to me about the ladder situation, so us two girls bonded over our fear of heights. A: I met her on the second floor of Forries, but Bernie doesn’t remember that. She had just shaved her head and everyone was admiring it. Vulvè Earrings by Bronte Leighton-Dore. B: A good yarn always opens the creative flood-gates. I take a lot from public talks, always walking away with my mind ablaze. Yet if ever I’m stuck on an idea I feel it’s always best to explain it to someone. I love that eureka moment, when you figure something out yourself, mid-conversation. It helps to elucidate. A: I love learning new skills, especially languages. But I also love mindless repetitive tasks, like weeding my garden or sewing – they let me think about other things while my hands are occupied. That’s always where I get my best ideas. What made you decide to start 107 Objects? A: I started at 107 as a volunteer back in 2016, and it was an idea that was kicking around back then. Our founding director, Jess, came up with the name. I had a bit of spare time, and I really liked the idea, so I decided to pick it up. There was no way I could do it on my own, though, so I pitched it to Bernie and she loved it. B: I was flattered that they considered me and was up for the challenge. I was eager to brush up on my business skills, learn more about the inner workings of 107 and become a closer part of the team – it’s all a dream. I’ve grown so much from this opportunity. Blak Heart by Nungala Creative, modelled by Bee Cruse. Starting a business is never easy. What have you learned along the way? A: Mostly that I’m really hard to work with! But also so much. How to keep good records… That’s something I’m really bad at. Also it’s been a really nice process just coming to realise how much I can trust Bernie, and seeing what she brings to the business. It really wouldn’t have worked without her. B: I think we both defined what a balanced workload is this past year. We’ve realised when to close the laptops – it’s not always about working overtime but working smart. Amy has taught me a thing (or ten) about work ethic too. I’m still training my brain’s filter, gauging when to release the creative demon within. Can you tell us about the upcoming collab with Leah Williams? A: Sure! It’s our first big collab and we’re really excited about it. Leah is a brilliant designer. She makes these incredible, tailor-made pieces that are both art and functional outfit at the same time. It’s been amazing to follow her from idea conception through to planning and the beginnings of production. I don’t want to give too much away, but it’s going to be a super-special, one-off creation (really one-off – there’ll only be 10 in the whole world). B: She’s making waves in the fashion industry and I’m stoked we’ve actualised this idea. We’ll be selling a limited edition creation by Leah. Helping promote this project will be her sister Emily, who’s photographic genius will soon be sailing over to Detroit. We’re all hoping to release this project to the public around MBFW. What are your hopes for the future of 107 Objects? B: Overall I hope to continue meeting mind-blowing new talent and keep my creative fire burning. I’d want to project 107 Objects further, so we have crazier opportunities come our way. We could level-up the scale of our collaborative projects and continue to build strong relationships with Australian creatives and businesses. Sky’s the limit… and then some. A: I hope that we can turn it into this creative force for good. It’s small now, but I think we’ve got this amazing opportunity to turn 107’s support into a real benefit for young and emerging artists. I think it’s also important that we continue to have fun with it, since we are putting so much of ourselves into it. If we’re no longer enjoying it, then what’s the point, really? Poser tee by jimbob jameson, photo credit Rhiannon Hopley. Do you have any heroes, creative or otherwise? A: I have loads! Annabel Crabb for her writing and for her brilliant hair, Anne Aly for being the first female Muslim MP, my little brother because he’s a good kid (don’t tell him I said that). There’s too many to name. B: Mum (always), yet also my great grandmother, Jessie Street. I’m so empowered by her hard work as one of Australia’s suffragettes and her role in campaigning for Indigenous rights for the 1967 Referendum. She inspires me to stir the pot and brew up something just as tasty for the world. A: Working in my garden or grabbing a coffee somewhere (shoutout to Artificer in Surry Hills). You can see the current collection at objects.107.org.au, or drop in and visit the exhibition space any day between Tuesday – Sunday.